I’ll start with the bad news: If you are dairy-averse, this is not the recipe for you. 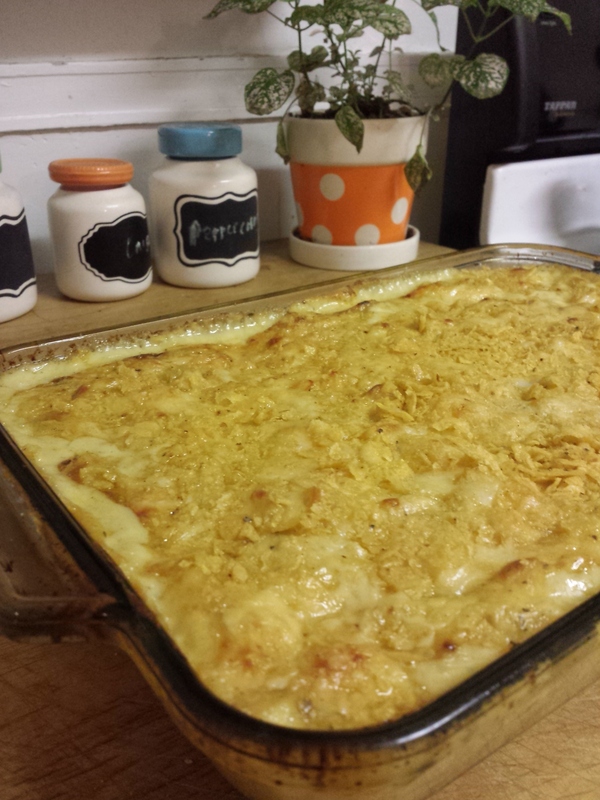 Mac and cheese never is, I guess, but this recipe incorporates a particularly fearless amount of butter, milk, and cheese, making it both a lactose extravaganza AND not very cheap, if you tend to buy quality ingredients. The good news, though, is: You may never eat boxed macaroni and cheese again, because this Indian fusion take on the dish could easily ruin you for anything else. It’s a treat. Vadouvan mac and cheese is a recipe I found a couple of years ago when I read Make the Bread, Buy the Butter, Jennifer Reese’s fantastic story-and-cookbook that chronicles her experiments with staple foods, exploring which taste better and/or are a better value homemade versus store-bought. Vadouvan is an Indian spice blend that is made up of a variety of herbs and spices, including curry leaf, fenugreek, nutmeg, turmeric, cloves, and garlic. As Jennifer mentions in her recipe, the hit of spice makes an otherwise overwhelmingly rich cheese sauce bearable, and the creaminess calms the spice down. It’s brilliant and, I hear, a kid-pleaser. It’s a great way to provide a hearty weeknight meal or entertain to impress without too much effort. My version cuts down on the amount of cheese, butter, saucepans, and time the cookbook recipe calls for, (as well as using penne pasta instead of elbow macaroni, and the dregs of a bag of organic tortilla chips, crushed, in lieu of fresh bread crumbs). I hesitate to use the word perfect, but the results are very, very tasty. Bring a medium saucepan of salted water to a rolling boil, and cook the pasta while you work on the cheese sauce. When the pasta is JUST under-cooked, drain it and set it aside. Melt the butter in a large saucepan between medium and medium-high, depending on your stove, then whisk in the flour to make a roux, and continue whisking for a minute or two until the roux has darkened some. It should be wet and lumpy, neither liquid nor crumby. If it’s got a liquid consistency, add more flour. If it’s dry, add a touch more butter or a small glug of olive oil. Mix in the milk one cup at a time, whisking after each addition until the mixture has thickened. Using a silicone spatula or wooden spoon, fold in the spices and grated cheese, leaving out just enough cheese for sprinkling at the end. Mix in the cooked pasta and scrape the whole creamy thing into a buttered 9″-x-13″ casserole dish. Sprinkle the remaining cheese and breadcrumbs (or crushed organic tortilla chips :)) on top, and bake, uncovered, in a 375-degree oven for about 30 minutes, or until it’s beginning to brown on top. Scarf it up with a squeeze of lemon on top, if you are so inclined, and for the sake of the children and all that is holy, serve it with vegetables. 21 Jan	This entry was published on January 21, 2015 at 3:08 am and is filed under Collection. Bookmark the permalink. Follow any comments here with the RSS feed for this post.